Aptly named, this is the best onion for showing for many a while! Whether you are a serious exhibitor or just someone who wants to take a crack at the village show, it’s worth giving this one a try. Like our existing variety, Globo, weights can get up to 1000gms, yet the flavour is still maintained and unusually for a large onion, it also stores well. 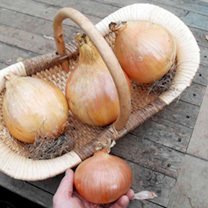 Much bigger than an ordinary onion! Crops from 24 weeks after sowing. For the best crops, dig and manure the soil in autumn or early winter, applying a light dressing of lime early in February and a week before sowings. Sow in grooves 1.25cm (½”) deep, 23cm (9”) apart. Thin plants out finally to 15cm (6”) apart. For exhibition onions, sow under glass December-January, transplant seedlings into boxes or pots and harden off for planting out in April. Row length per pack: 6m (20’) unless otherwise stated. ‘Triple pack’ row length: 18m (60’).